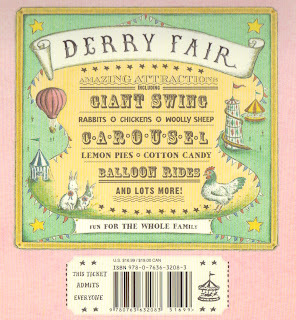 Hurry Down to Derry Fair, written by Dori Chaconas and magnificently illustrated by Gillian Tyler reminds me of books from my childhood. I grew up with everyday intricacies of Richard Scary's stories and illustrations and the darkly magic world of Maurice Sendak, but I also grew up with the lush watercolors and intimate domestic details of the books of Tasha Tudor and Beatrix Potter. 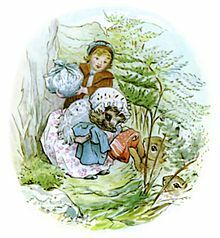 And, while I love them all, I definitely have a soft spot in my heart for Tasha Tudor and Beatrix Potter. 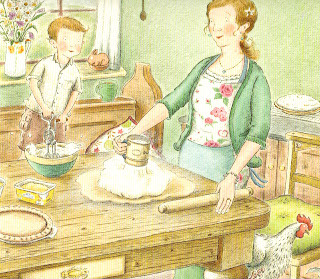 Perhaps this is what makes the works of Janet and Alan Ahlberg of The Jolly Postman Fame, immediately lovable to me. 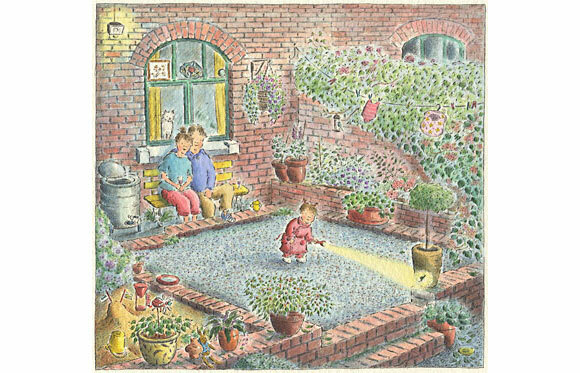 Sadly, Janet Ahlberg died in 1994, but Alan continued to write and work with other illustrators. 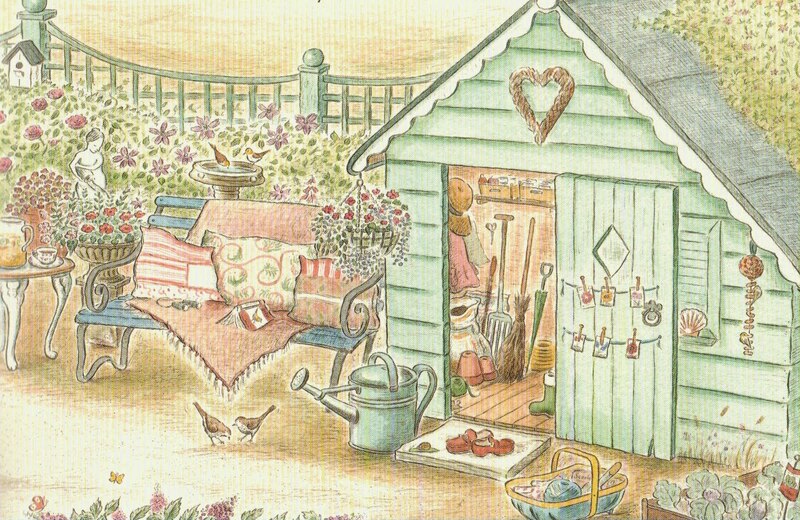 Gillian Tyler's style comes closest to that of Janet Ahlberg's, both illustrators capturing the the lush feel and attention to detail that I love in Tudor and Potter's work. With Hurry Down to Derry Fair, Tyler's talents are on full display. Dori Chaconas' tale of a little boy, Dinny Brown, anxious to the fair, is playful and melodic. Dinny goes to each of his family members asking to be taken to the fair. 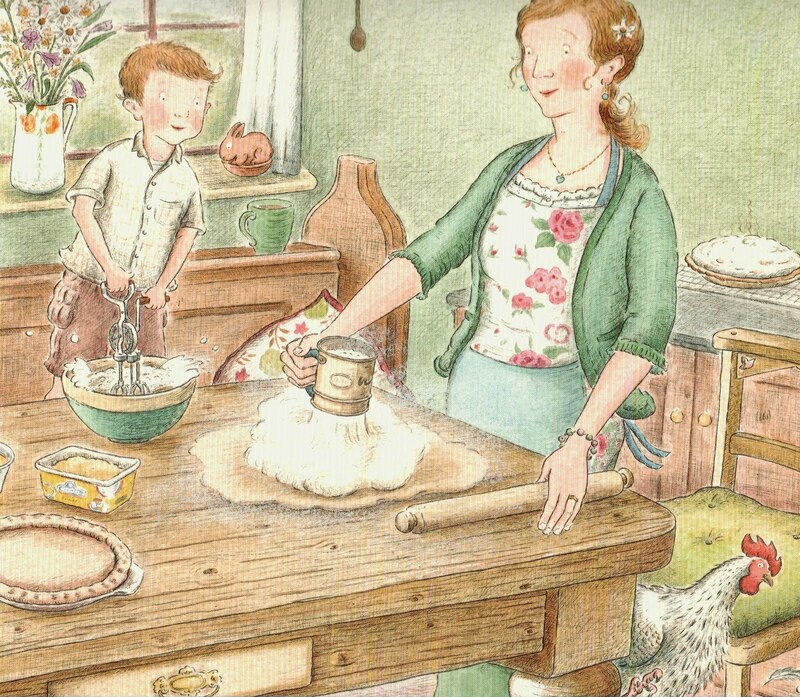 But mother is making lemon pies with the hope of winning a prize, father is chopping wood to sell and sister Lucy is grooming her animals for show. 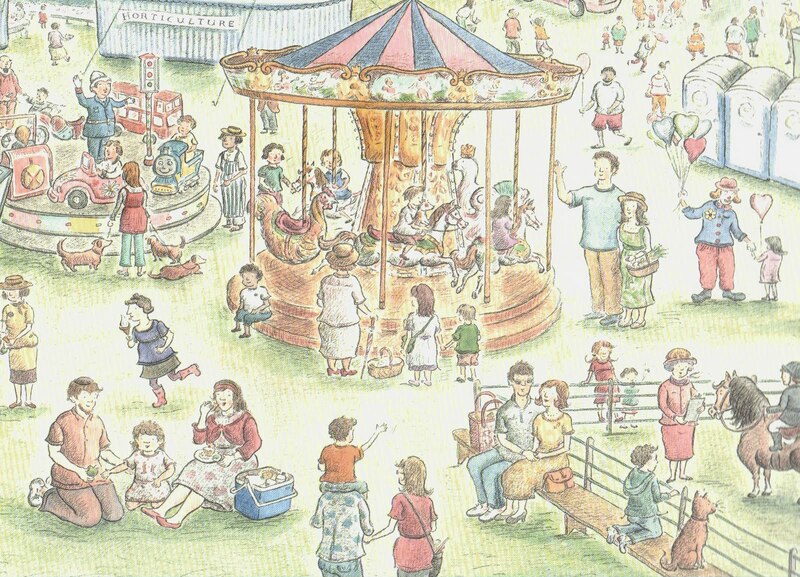 Double page illustrations that show Dinny going from family member to family member are interspersed with single page pictures that show what awaits him at the fair. Finally, Dinny finds Grandma Patty in her garden. Grandma Patty answers his plea with, "You're right! It's late!" and the two run off, hand in hand. 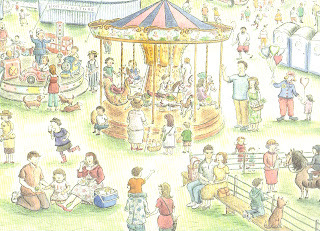 The last pages of the book are a fold out, four page spread that is marvelous, one quarter of which can be seen below. Tyler captures the excitement and treats that await Dinny and his pocket full of coins. 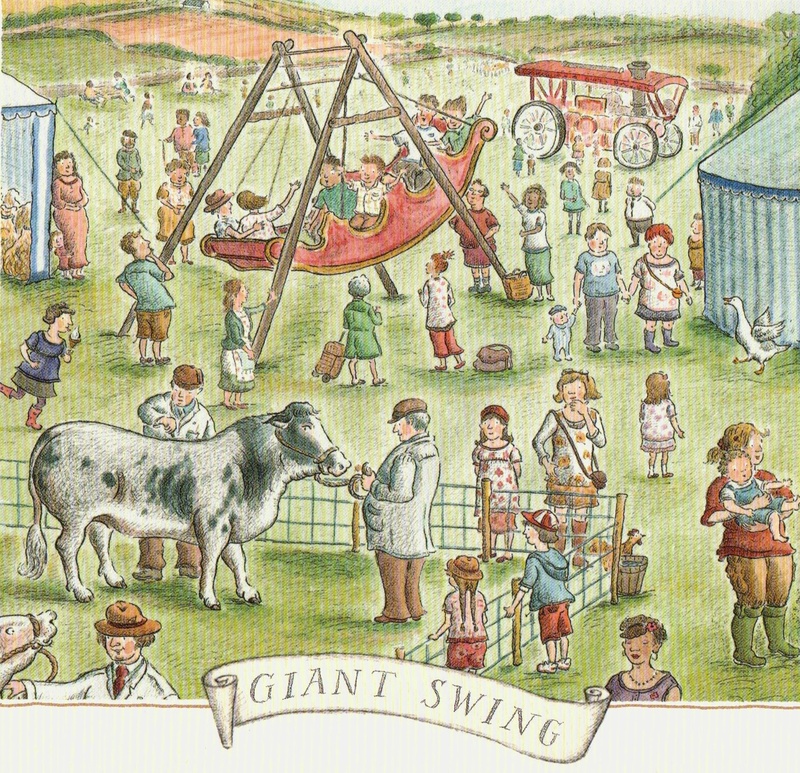 I realize that state fairs (Chaconas grew up in Wisconsin) and one-day country fairs (Tyler is British and lives in Penistone, an ancient market town that holds England's largest annual one-day fair) are not typical childhood experiences for most young readers. However, I think that the exoticness of this event (for some readers) is what makes it all the more appealing and possibly even magical. I never saw a corgi dog, hedgehog or colorful garden patch when I was growing up and maybe that is why I found so much to be fascinated with in the works of Beatrix Potter and Tasha Tudor. 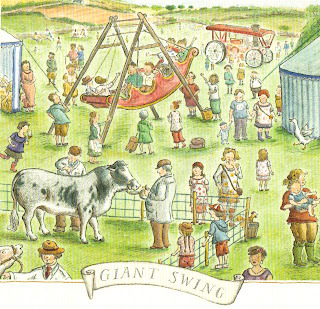 With the detailed filled illustrations of Gillian Tyler, I have no doubt that other children, whether they can relate to this story or not, will fall in love with it the way I did. 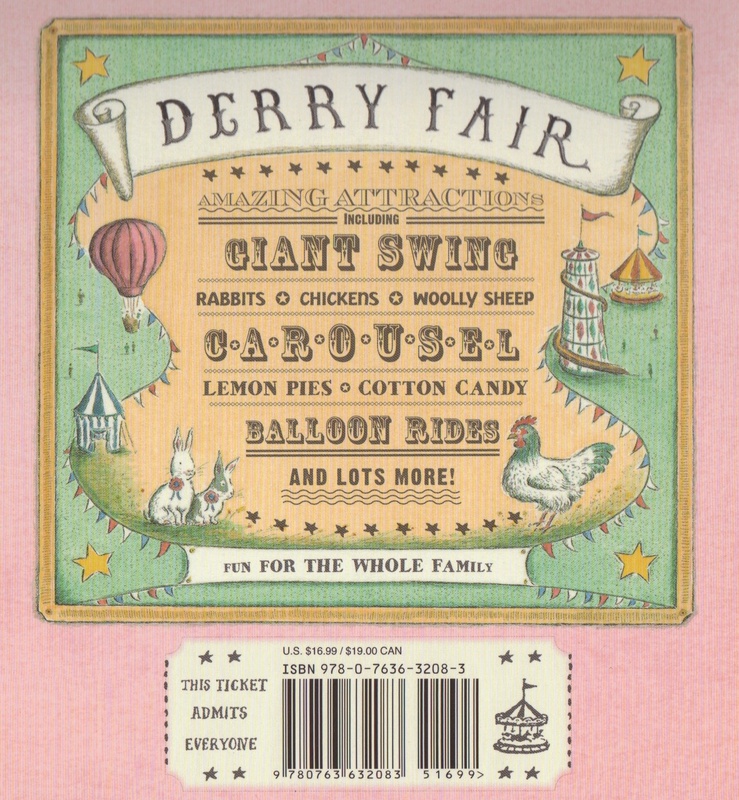 One last nifty detail - the back of the book is a poster for the fair with the barcode serving as a ticket! If you aren't familiar with Gillian Tyler or Alan Ahlberg, be sure to seek out these books! Treasure Hunt is the story of toddler Tillie and her parents, who have fun hiding her toy rabbit and her breakfast banana so she can hunt for it. Tillie likes to surprise her parents by hiding from them. Tyler's charming, detailed illustrations bring the child's world to life. The Snail House tells the story of three siblings who shrink down and live in a house that is on the back of a snail. Magical and sometimes suspenseful moments make this book a visual feast. Sadly, both are out of print but might be at your local library. Thanks for the reminder of Gillian Tyler! I adored "Treasure Hunt" when it first came out, and have been trying to remember the title/illustrator ever since! My pleasure! I love the detail and intricacies of her work. Glad to have reminded you. How are there so many wonderful books that I have never heard of? When I read your review, I immediately checked to see if my library had Snail HOuse. It did. We read it and the kids begin to chant "buy it, buy it". I found a used copy online. As I go broke from purchasing books my consolation is that we always get so much use out of the books and I have 3 little kids that the books pass through. Have you ever read Elsa Beskow's Children of the Forest. Also about a mini family who live in harmony with nature. Excellent! 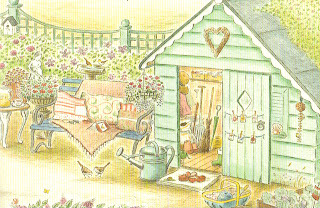 I am so glad you found SNAIL HOUSE - both at your library and for sale used! And glad to know that your books get so much attention at home! I am heading off to work now and will look for Beskow's book - it sounds fabulous and you always know these great books that I've never heard of. Thanks for the compliment. I have to admit that I love searching for less popular books to read to my kids. My boys have been loving Captain Raptor and the Space Pirates and Captain Raptor and the Moon Mystery for a while. AFter you recommended Meanwhile by Jules Fifer and the boys loved it I started looking for some picture books in the same comic book style. It is Stars Trek meets Jurassic Park and your son might enjoy them too. Yet another book to look for at work tomorrow! Sounds cool!